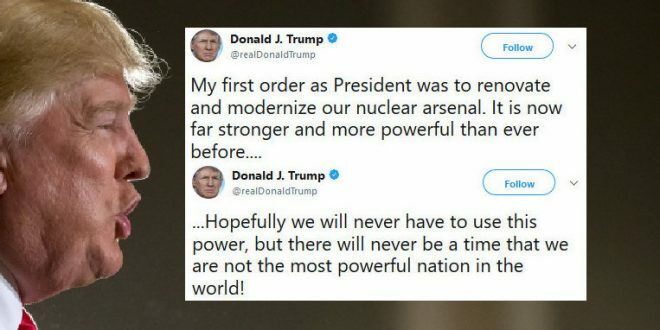 Trump Boasts About Power Of US Nuclear Arsenal - Joe.My.God. The tweets are a remarkable doubling down of the hostile rhetoric the president deployed yesterday from his working vacation in Bedminster, New Jersey. After news broke that North Korea had developed necessary technology to outfit a nuclear device on an intercontinental ballistic missile, Trump warned that he was prepared to rain “fire and fury” on the regime should they continue the escalation. If you think the entire US strategic arsenal has been renovated in 8 months, you might be a Trump supporter. On a more serious note, Trump did not modernize our nuclear arsenal. Obama authorized that process to begin, and it takes decades.